John is now 26 years old. He still has a range of social maturity that can present itself anywhere from kindergarten behavior to teenage behavior to mature adult behavior. He cannot predict at what level he will be functioning, so we take precautions to always have an external brain (trained mentor/coach) close by to offer guidance and cues to get him back on track. John has a healthy romantic relationship with Sheena, a young lady in California who also has FAS and is about the same level intellectually and functionally. They would like to marry and live together someday, but SSI and state regulations may not allow this to be possible without great financial hardship. Sheena and John are engaged, and see each other every few months when Sheena comes to visit for about a week. See photo slide show at the bottom of John's picture page. In preparation for when they will become sexually active, John has had a vasectomy to ensure there are no children resulting from this relationship. John had counseling and guidance for 3 years prior to having the vasectomy, and he allows me to share this story with others in hopes it will help others who guide teens and adults with FASD to make healthy decisions. John is still living at home, but I am in the process of applying for residential placement for him. This will be an independent living situation where John will choose his apartment and roommate and the state will contract to provide 24/7 staffing to ensure his safety. John still shows poor judgment and lacks impulse control at some times, but other times he acts with insight and wisdom. The neurological manifestations of FASD are inconsistent and unpredictable, one of the more problematic aspects of FASD because people have expectations based on what they see on "good days" rather than on his over-all functional ability. John no longer needs help shaving, as he now has a cordless electric shaver that is self-cleaning. But he still needs to be checked to show him where he misses spots, just as he needs to be checked to see if he used soap or shampoo in the shower. He is still working at Desert Survivors, a native plant nursery, and has success there because his job coach provides him with the supervision and guidance he needs and understands the nuances of FASD. 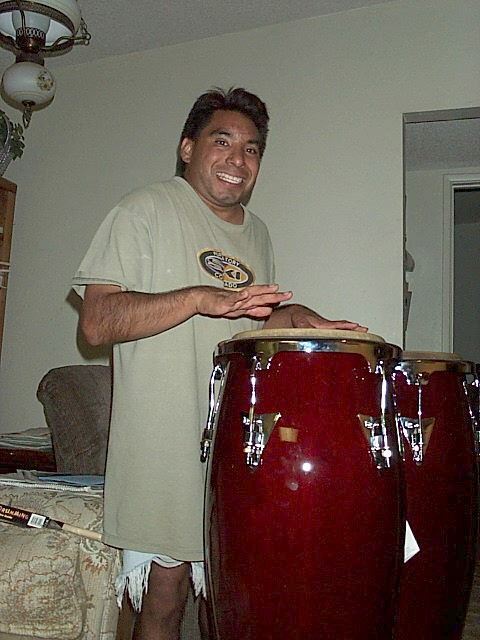 John plays the drums (trap set and congas) in the church band. This is John's first experience of natural inclusion into the community. He was invited because of his music skills and he is valued as a contributing member of the music group. Of course, he requires my presence at practice and during the service (or that of another qualified "external brain") to ensure he doesn't get into trouble with his inappropriate social behaviors. He feels really good about fulfilling this dream of playing in a regular band. The concept of Spirituality is a bit too abstract for John to grasp, but he fits in quite well with the church community. John's relationship with Sheena is moderated and supervised, they display genuine affection and have a strong friendship that is reinforced with several long-distance phone calls every week. They are remarkably appropriate when together and they bring out the best in each other. A relationship of this sort is not common among individuals with FASD, but in this case it works because of all the protective factors (early diagnosis, understanding and acceptance by all regarding limitations imposed and restrictions needed, eligibility for services, stable home environment, etc.). Although things are going well for John, there are times he has a hard time coping with his FASD. He recently shared his thoughts and feelings with me, and I wrote them down in poem format. Read "Help!” which is on the web site’s Grieving section. I have lots of fears about placing John in a residential setting, even one that is natural and based on self-determination, because the quality of care in provider services is very questionable, even in agencies with a strong commitment and good understanding of clients with FASD. The safety net upon which John's safety and well being depend will only be as strong as the weakest strand, which would be the newly-trained, well-intentioned line staff who might disregard parent instructions and team agreements regarding John's need for supervision because of assuming incorrectly that John is capable of handling more freedom than is prudent and thus placing him at risk of getting arrested or injured or worse. I try not to think about that too much, but just move forward with plans to help John pursue his dream of living "on his own" and my dream of pursuing a career and possibly engage in a social life, which is not possible now while I am John's primary caregiver. John shared this testimony at the Town Hall Meeting that was held here in Tucson last month: "I like my job at Desert Survivors, and I enjoy my relationship with my girlfriend Sheena. Life is good. But I would like to move into an apartment with Sheena and maybe we can get married. I'm 26 years old and it's time for me to move out. Besides, I want to give my Mom her independence." Everyone laughed, but it is true. He added, "I know I might not have as much freedom in a residential placement as I have at home now, but that's okay." That was one of his more mature and insightful moments. As he gets older, he has fewer meltdowns and less frequent "Fassy" incidents. John is a classic example of full FAS, and his life is a model of success. Unfortunately, this is not common for adults with FAS or FAE. Hopefully, my sharing what has worked to bring about John's success will help others plan for children as they transition to adulthood.